Officials in Italy have released highlights of the official investigation of the car-bicycle crash that killed Nicky Hayden. The report apportions 70 percent of the blame on the driver and 30 percent on Hayden. According to regional newspapers and websites, including RiminiToday.it, deputy prosecutor Paolo Gengarelli has received a report from a forensic accident investigator, Orlando Omicini, who was hired by the procurer’s office. Omicini previously had a 30-year career investigating traffic accidents with the Polizia Stradale – Italy’s Highway Patrol. He based his report on the driver’s statement, eyewitness accounts of nearby road maintenance workers, the extensive documentation of the scene by police and, critically, video of the accident recorded by a nearby security camera. The expert’s findings have partially reversed earlier suggestions that the accident was mostly or entirely Hayden’s fault. On May 17, the racer was out for a training ride on his Specialized bicycle, leaving the area of the Misano circuit on a narrow road called Via Ca’ Rafaelli. He was struck by a Peugot 206 car immediately after entering the two-lane Strada Provinciale 35, known locally as via Tavoleto. Omicini concluded that the Peugot 206 car was traveling at almost 73 kilometers an hour (45 mph) on a road with a 50 kmh limit. There was no evidence that the driver applied the brakes prior to hitting Hayden. The impact shattered the frame of the bicycle; Hayden hit the right side of the windshield and was tossed more than 15 feet upwards. The consultant’s report assigned 70 percent of the blame to the speeding car driver, and 30 percent of the blame to Hayden himself, because Nicky failed to observe the stop signs at the tricky, blind intersection. Hayden entered the intersection at 20 kmh — a speed that would have been quite a bit slower than his training pace but which was still much too fast, considering the poor sightlines at the scene. Nicky was also wearing ear buds at the time, so may have been listening to music or otherwise distracted. The prosecutor acknowledged that if either the driver had been obeying the speed limit or Nicky had obeyed the stop signs, the accident could have been avoided. Under Italian law, every fatal accident triggers criminal proceedings. Now that the prosecutor’s expert’s report has been filed, forensic experts hired by the lawyers representing the driver, and by the Hayden family, have about a month prepare their own versions of the events leading to Hayden’s death. According to Rimini Today, those investigations are being led by two civil engineers named Alfonso Micucci (for the driver) and Mattia Strangi (for the Haydens). Both experts teach engineering at the University of Bologna. Micucci is expected to conclude that the car driver would not have been able to avoid Hayden even if he’d been traveling at the posted speed, and thus that Hayden’s failure to stop was the main causal factor. Here in the United States, vehicular manslaughter is a comparatively rare charge; criminal charges appear to be rare generally in road accidents that do not involve operator impairment or leaving the scene. That’s not the case in Italy. Although the prosecutor won’t formally charge the car driver until all the experts’ reports are in, the Italian daily Libero and the InSella motorcycle website are typical of Italian coverage of the case, in that they assume the procurer’s office will move forward, to trial, with a criminal charge of involuntary manslaughter against the driver. If convicted, the driver faces a penalty of five to 10 years in prison. Italian reporters covering the case suggest that the sentence will be cut in half if the court rules, as expected, that Hayden was also partially responsible. Il Resto del Carlino further reports the Hayden family and Nicky’s fiancée have also hired a lawyer and have said they’ll seek damages in the case. Under Italian law, there will not be a separate civil trial; liability will be determined on the basis of the criminal case. Representatives of the family recently collected the bicycle, which had been held as evidence. This image shows the driver's view as he approached the hamlet of Casette. The sign on the right warns of the intersection ahead.Google Maps image. I’ve ridden motorcycles and bicycles in Italy. While it appears certain the car driver was technically speeding, I know from experience that 70 kmh is not an exceptional speed for Italian drivers on roads similar to Via Tavoleto; I think obeying the speed limit would be exceptional. The Italian expression for a "California stop" is "burning the stop sign." 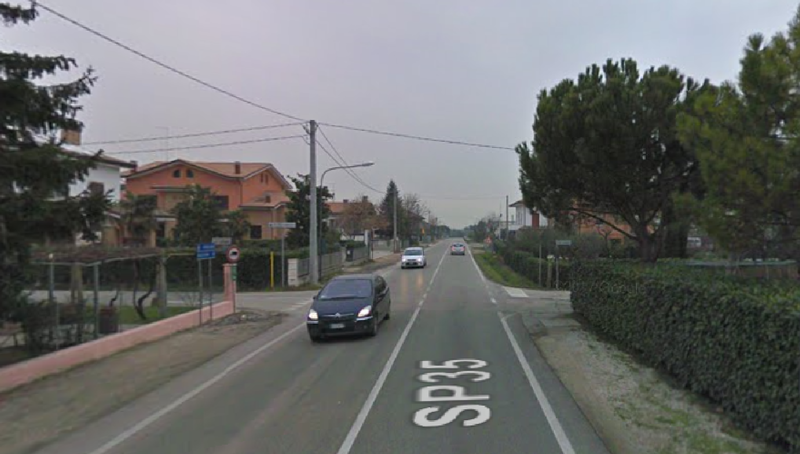 The commander of the regional Polizia Municipale — the police agency that initially responded to the accident — told the Italian website Fanpage.it that poor visibility from side roads like the one from which Nicky emerged make coming to a full stop essential. Hayden emerged from via Ca’ Rafaelli, the narrow road visible on the right. Visibility for both parties was limited by the hedges. Google Maps image. From the driver’s perspective, lane position was critical. A few feet right or left result in a dramatically different viewing angle, past the hedge and up Via Ca’ Rafaelli. The driver’s lane position would also influence Nicky’s ability to see the oncoming car. As far as I know, the CCTV footage of the actual accident has not been made public, nor have I read a definitive description of the accident that specifies Nicky’s intent upon entering the intersection. Obviously, he had three options: he could turn left, across oncoming traffic; ride straight across; or turn right, effectively merging with car traffic on SP35. What if Nicky planned to roll through a right turn out of that side road and merge into the lane the car was traveling in? By European standards, there was plenty of room for a car and a bicycle in that lane. However, both wheels of Nicky’s bicycle seem intact in photos taken at the crash scene. It’s hard to believe that if he’d been collected from behind by a car going 50 kmh faster, the rear wheel wouldn’t be damaged. The damage to the bicycle, and the scrapes on the hood of the car, are consistent with with the car hitting the bicycle while it was crossing its path. This is the view of the intersection from Hayden's perspective, approaching SP35. There are two stop signs and he had a very limited view of oncoming cross traffic. Google Maps image. According to il Resto del Carlino, the 30-year-old driver who hit Nicky was on his way to work, in a car registered to his parents; he submitted to a blood-alcohol analysis at the scene, which established that he was not impaired. Both personally and through his father, he’s expressed profound remorse. The authoritative Italian sports daily Corriere della Sport reported, in July, that he had returned to work but was being treated by a psychologist. However, his life will get even worse before it gets better — if he ever recovers from what was evidently a traumatic experience for him, too. Under Italian law, blame is apportioned in every fatal accident, and it seems likely that some of the blame — perhaps most of it — will be placed on him.